On first glance, elements and compounds might appear different, yet they share many similarities, like being made up of atoms and having bonds linking their atoms together. Elements and compounds also share the qualities of being both pure and homogeneous substances. Matter is any substance that occupies space and has mass. Science calculates all substances into three groups: Elements, compounds and mixtures. Interestingly enough, elements and compounds share more characteristics in common with one another. The basic unit of matter is the atom. And when two or more atoms combine chemically, they form molecules. Two major types of molecules exist, elements and compounds. An element is a type of molecule comprised of only one kind of atom. The element of gold, for instance, is comprised only of gold atoms. By contrast, a compound is a molecule that consists of different types of atoms or different types of elements. The compound of water consists of two hydrogen atoms bonded to one oxygen atom. Atoms stabilize by forming bonds with one another. Correspondingly, elements and compounds exist in stable form because of the bonds formed between their atoms. The two major bonds in chemistry are covalent and ionic bonds. Covalent bonds form when atoms share electrons, like the oxygen element existing in stable form as two covalently bonded oxygen atoms. Ionic bonds, on the other hand, form when one atom loses an electron to become positively charged, and a second atom gains the electron to become negatively charged. The positive and negative charges attract one another to make the two atoms bond ionically together. This happens in the compound sodium chloride known as common table salt. Essentially, the sodium atom's positive charge is ionically bonded to the negatively charged chlorine atom. Aside: While the noble gases are generally stable by themselves, there are situations where they can bond with atoms. An excited noble gas atom can form bonds in a process called dimerization. Dimerization makes it possible for a noble gas atom to link up with other atoms nearby or to make compounds in the laboratory. This is demonstrated by the highly volatile compounds of platinum hexafluoride PtF6, xenon hexafluoroplatinate XePtF6, and xenon dioxide XeO2. Purity of a substance means the substance cannot be broken down any further without losing its unique physical and chemical properties. Think of it as "the sum is greater than the individual parts." Hence, an element is pure because it is composed of only one type of atom. Breaking down that atom would only arrive at subatomic particles, not the atom itself. 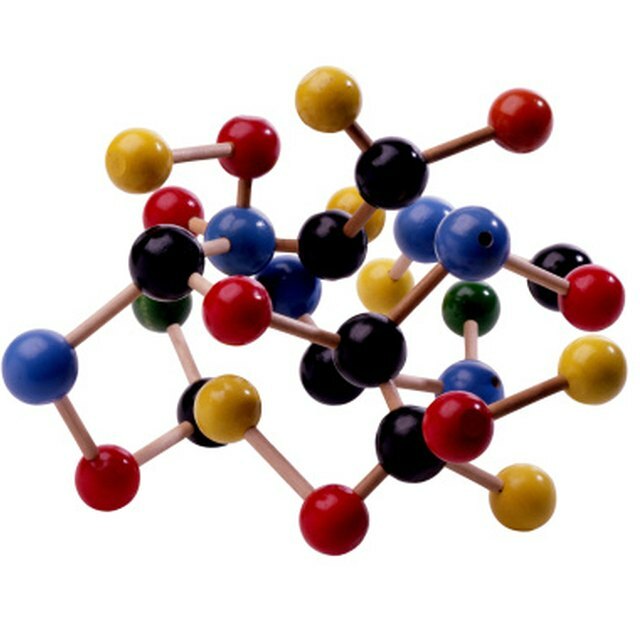 A compound is pure as well because it is made up of only one type of molecule. Breaking down a compound further would only lead to the individual atoms or individual elements that comprise that compound. Particular physical and chemical properties are associated with pure substances. Breaking down those pure substances would only lead to components that have entirely different physical and chemical properties from the pure substance itself. In chemistry, homogeneous means that a substance has the same appearance and uniform composition throughout. Put simply, a slab comprised of the element silver has only silver atoms throughout. Additionally, the entire slab exhibits both physical and chemical properties of the element silver. But a rusting slab of tin is not considered homogeneous. By the same token, the compound water is homogeneous when it is pure. If the water is contaminated, it is not homogeneous anymore, but heterogeneous. So a pure element and a pure compound are both homogeneous because they are untainted and retain all their properties consistently. What is the Difference Between Pure Substances And Mixtures? Agravante, Mariecor. "Three Similarities Between a Compound and an Element." Sciencing, https://sciencing.com/three-similarities-between-compound-element-8564668.html. 23 April 2018.